Jan. 2017 Wreck Beach Swim Night! Thank you for participating in our Wreck Beach Swim Night today! It was quite successful and we are happy about having new members as well! We’ve had struggle to keep operating the swim due to the slow business… however, it was totally different tonight. At the same time, we had to raise the price for first timers. We W.B.P.S. will have to think how to advertise the swim. We’d like to say thank you to all the participants and all the volunteers! Our next swim is February 18(Sat.). Wreck Beach Events goes all year around! Wreck Beach Swim Night is Back! Our Off-Season Events starts earlier this year! Entry fee (Cash only) $12, $10 for members, $5 if it is your first visit, Free for kids 10 & under. Wreck Beach Events are all year around! NIFTY Swim Night Tomorrow… NOT 31st! Due to Halloween next Saturday, we are going to have NIFTY Swim Tomorrow! 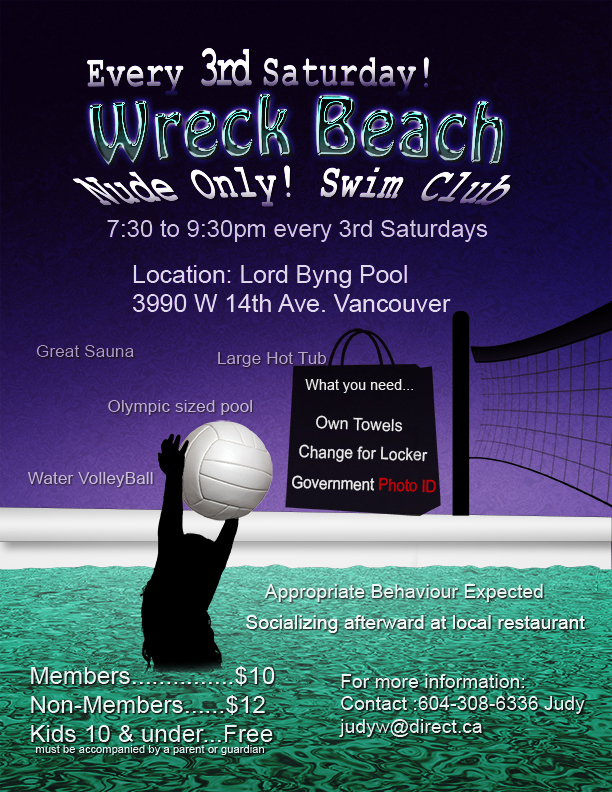 Wreck Beach Swim Night is Back!!! Entrance fee (Cash Only) $12 for non member, 10 for member, Free for 10 & under with supervisor. 25 cents coin for locker. $5 if it is your first time!! Come and bring your friends. NIFTY swim night Tonight at 7:30PM! This is the LAST SWIM NIGHT of the season!! $5 if it is your first time!! Come and bring your friends. No bathing suits and you must have Government photo ID. NEXT ONE is going to be OCTOBER! Our Wreck Beach Season is around the corner!! I wish you all have a happy holiday. 7:30PM @ Lord Byng Pool. “The WBSC will not be holding a second swim in January as tentatively announced by Korky Day. The first swim of WBSC in 2015 will be from 7:30-9:30 p.m. on Saturday, January 17th. This week, Location is NOT Templeton Pool! It is going to be Renfrew Pool, 2929 East 22 Ave Vancouver BC.